Who is the Frugal Foodie? Olivier Brouillet has worked as a manager for both Joel Robuchon and Thomas Keller. In 2009 he decided to ditch the world of Strip fine dining to open Baguette Café with his chef parents, Lucien and Claudie. Originally from the south of France, this 4th generation restaurant family has set a new bar for casual dining in Las Vegas by serving items such as sandwiches, soups and pastries done with such skill they could be served at the restaurants of Olivier's former employers. Here is an inside look on what makes this family special, why they are offering are not only delicious but socially conscious food, and the dishes you need to order that aren't on the menu. With your family's extensive culinary background, what made you decide to open a café rather a fine dining restaurant? This was a fun project for us to take on, as we have never done such casual food before. We approached pedestrian foods by using real cooking techniques. For example, we cook all of our chicken sous vide in an immersion circulator. We really wanted to make good food accessible to everyone, and so far it's been successful. We have been rated in the 100 highest ranked affordable restaurants in the US by Yelp. What do you like about doing business in Las Vegas? The people. We have incredible customers who love what we are doing. Nothing is better than seeing them get excited about the food we’re making. In France, people are always looking for what's wrong. Here people are happier and appreciate the food. We find it so touching that people will write such lengthy reviews about us on Yelp. In France, customers would never spend the time to do this. Coming from the south of France, do you find it difficult to get the quality of ingredients you grew up with? Not really. Because we have the Strip, there are so many purveyors in Las Vegas who can get you anything you need. We make everything from scratch, except our croissant dough which we import from France because we don't have the kitchen space for the necessary equipment. One small challenge has been the climate. We bake our baguettes in small batches throughout the day, because if you only bake in the morning the bread will dry out by two in the afternoon. How do your parents divide up the cooking roles? My mother does the baking and my father does the soups, spreads, and sauces. Neither uses recipes. My father rotates through over thirty different kinds of soups and gets his inspiration from whatever we have in the refrigerator. Our favorites are probably veloute and cream of Jerusalem artichoke and cream of white onion with goat cheese and curry spices. Your location in an office complex makes it a little difficult for people to find you. Has this hurt your business? At first all of our customers were office workers from the complex, but now our customers are about 50% office workers and 50% foodies. Our customers are spreading the word and bringing new people in all the time. The majority of our customers are repeats. What is your favorite sandwich? I am a vegetarian and eat raw whenever possible, so my favorite is probably one made with a sun-dried tomato and walnut pesto roughly processed to give it a nice crunch, as well as avocado and roasted red peppers. About 80% of our menu items are available either with or without meat, so some customers will opt to get this with chicken. We always offer two or three vegan sandwiches as well. What is the best thing to order off the menu? About half of our menu is actually 'off the menu.' We will run specials and then our customers will come back requesting them, so we keep making them. Le Basque sandwich made with béarnaise, roasted pork, sautéed mushrooms, fresh organic spinach, tomato, and shaved parmesan is popular, and so is The Catalan made with dry cured ham, chorizo, cottage cheese, honey, lavender, roasted garlic spread, and roasted red peppers. We can only offer The Catalan sometimes as it is difficult to find good chorizo. What besides the food makes your business special? Our ingredient sourcing and hospitality. We source from ethical companies because in our opinion, buying responsibly is more powerful than voting. We do not stock Nestle products like Perrier, or any Pepsi products, because they are buying the water rights out from under people who have no power to stop it. We also buy as many organic ingredients as possible and source from farms that practice sustainability. As far as hospitality, we are trying to help create a sense of community in Las Vegas. We know hundreds of customer names and see our customers getting to know each other as well. We think people are really craving these kinds of interactions. I wouldn’t generally dine at a place called ‘Thai Food To Go’ as the menu sounds like it would be about as creative as the name, but this E. Desert Inn hole in the wall had shining reviews on Yelp so we decided to check it out. Not surprisingly, the restaurant’s main business is of the ‘take-out’ nature, but surprisingly, they offered much more than standard ‘take-out’ fare, including Roasted Duck Curry and Spicy Fried Catfish. The charming, five table dining area meant we didn’t have to wait to get home to enjoy our dinner, and the place was so popular that the seats had completely filled up by the time we left. We ended up starting with a few light favorites that we tend to try at every Thai restaurant - Larb ($6.95) and Papaya Salad ($5.95). Larb consists of ground meat (either pork or chicken), mint, toasted rice powder, and lime dressing accompanied by slices of crunchy cabbage and Papaya salad is made by laboriously pounding young green papaya with palm sugar, lime juice, and fish sauce then tossing with tomatoes, raw green beans, and peanuts. I have always loved Papaya salad but have only recently started eating it again (I burned myself out after my quest to find the best version when we traveled to Thailand in 2008). Thai Food To Go’s is a better rendition than most I’ve had in recent history. While refreshing, the cool salads ignited our mouths, which was a good indication of the restaurant’s authenticity. Since that trip to Thailand we have a great appreciation for restaurants stateside that use actual Thai chilies. Most settle for red pepper flakes, which really don’t capture the essence of authentic Thai flavors. That being said, be mindful of the heat level you choose (we chose 8 and 5, respectively, but both were like 10’s). We followed the salads with the pumpkin curry, which is listed on their board but not on the menu. We ordered beef and they gave us chicken, but we didn’t care because it tasted great and we loved the pumpkin. It was tender enough to eat the skin, and the flavor really complemented the sauce. For $8.95, you can’t go wrong. Fortunately, my dear friends live near there so we brought them take-out and got to sample a few more items (this place isn’t close to me, so I wanted to maximize the experience). They requested the Chicken Fried Rice ($6.95) and Thai Beef Jerky $7.95), and both were well-received and deemed worthy of ordering again. The jerky was especially addictive with the accompanying spicy sauce. I also brought them Salmon Panang Curry ($9.95), which was equally tasty and another great value. Thai Food To Go really is a perfect Frugal Foodie spot, as the food quality exceeds the price. It’s probably not worth traveling across town for unless you are really cheap, but if you love Thai food it is certainly worth a fifteen minute drive. They also deliver, so if you live close be sure to grab their menu for your junk drawer. I’ve read Mad Cowboy and have seen Food Inc. a few times so I try to eat a lot of vegan meals, but completely eliminating animal products from my diet is a step in life I can’t commit to at this point. I do believe in filling my body with good nutrition, however, and for that I turn to my favorite place for a healthy meal, the Bronze Cafe. located in The Center off Charleston and Maryland Pkwy. Though the Bronze Cafe has a wide variety of vegetarian, vegan and gluten-free options, the focus is really more on health than pushing a way of eating. Everything is made from scratch, and for the most part it’s all pretty great. My favorite items on the menu happen to be vegan, The Good Earth pita and The Bizness salad (both $9.95). The Good Earth is made with roasted vegetables, mixed greens, housemade romesco, hummus, alfalfa sprouts, lemon vinaigrette, and cayenne-spiced caramelized sunflower seeds, all snuggled nicely together in a soft warm pita. It’s completely satisfying and comes with a tasty but unnecessary side salad. The Bizness can take on any personality you like, as you get to top chopped kale massaged in a lemon vinaigrette with three toppings of your choice. I recommend the agrodolce brussels sprouts, curried chickpeas, and mini beet salad with quinoa, but I sometimes sub with the roasted broccoli with hemp hearts or curried quinoa salad. You can’t get much tastier for something as healthy as this. Since the cafe is located in the Center, you will find a bit of gay humor in the menu, such as the Blueberry Boy Bait bar and The What What (if you haven’t seen the video this is named after, check it out here). The L BGTQ sandwich is quite popular, probably due the the addition of very un-vegan bacon jam, maple-glazed bacon, and basil aioli. There are a lot of drink options to choose from, including smoothies, coffee drinks (available ‘creamers’ include soy milk or house-made almond milk), and fresh juices like Cantaloupe Turmeric and Pineapple Mint Chia ($3.75). The daily soup can be bland at times, but they always offer samples so you can see if it’s a full flavor day or not. Bakery goods are always fresh but hit or miss (mostly miss), and I actually kind of like that. I’d feel guilty about not being Vegan if butter wasn’t necessary to make desserts taste really good. When I want to feel extra great about what I’m eating while doing my part for the Earth and its creatures, I make my way to The Bronze Cafe. I hope you, do too. Together we may save at least one cow (or perhaps something smaller like a chicken). No cuisine is more American than barbecue, and no barbecue restaurant in Las Vegas embodies the American dream more than Rollin’ Smoke. Chef John Holland’s story begins in his birthplace of Magnolia, Arkansas where he worked in wholesale construction for the better part of his life. His passion for cooking, as well as his desire to be near his dad, fueled his decision to ditch his hometown gig as Pitmaster of the company picnics and head to Sin City. John immediately funneled his friendly Arkansas spirit into block parties, where he and his father invited the whole neighborhood to come out and enjoy their barbecue specialties. He decided to further his culinary education by enrolling at Le Cordon Bleu, and shortly after graduating one of his block party guests invited John to sell his soulful creations outside the man’s hardware store on Valley View and Russell. On the first day John sold three sandwiches in four hours, but within two weeks he was selling seventy five sandwiches in two hours. John continued cooking on the side of the street six days a week for three years with help from his pop, who would tend to the barbecue while John was working swing shift in the kitchens of Station Casinos. He soon ran out of cooking space to expand any further, so he decided to move the operation from his garage to small strip mall tucked beneath the 15 at Highland and Desert Inn. Rollin’ Smoke now had a place to call home. John’s affable brother Dusty moved out to help John and his dad open the restaurant, and for the first four months it was just the three of them. John cautiously kept his casino job for the first year, knowing that most restaurants fail during this crucial time. His fears dissipated as the accolades started flowing in, and the restaurant quickly earned national recognition as one of Localeats.com’s top twenty barbecue restaurants of 2013. John attributes his success to following his passion to cook the food he loves and strong desire to put smiles on the faces of all who eat it. Arkansas isn’t part of the four main regional styles of barbecue, but John calls what he creates his own version of Arkansas BBQ, or simply a combination of all the kinds of barbecue he likes. The ever-praising Dusty considers his brother to be a pioneer in the kitchen, modernizing soul food with twists like the Outlaw Burger, the BBQ Parfait, and the family’s personal favorite, Smoked Meatloaf. The meatloaf is made by combining his mom’s recipe for the retro dish with pulled pork that has been smoked for fifteen hours, brisket that has been smoked for eighteen hours, and then smoking that concoction for another six. It is doubtful this much time and thought has gone into any other meatloaf ever prepared. For the purists, Rollin’ Smoke’s baby back ribs are tender as can be without disintegrating off the bone, and the sauce is something special to say the least. It’s light and tangy with the optimal mix of heat and sweet, and so delicious you’ll want to order an extra side or two if taking food to go. Don’t miss out on a side of Kicken’ Beans, which are spicy and slow-baked with hot links and pulled pork. John and his family have embraced Vegas as home, and love that people from nearly every continent have come to try their ‘cue. You can feel the love and Southern hospitality from the moment you smell the smokers outside, an experience that sticks with you as you leave with a fully belly and happy heart. The whole crew down to John’s four and eight year old daughters help create this for you, so get your dose of family and phenomenal barbecue at Rollin‘ Smoke, and follow Dusty’s order to “put a little South in your mouth”. That's the meatloaf buried under a mound of crispy onion rings. Here was the fish tank recently created for the TV show "Tanked". It has a bunch of fake meat and little fish in it. Every once in awhile I eat at a restaurant in Vegas that makes me feel guilty for not having been active with my blog. The guilt stems a bit from my dad's nagging (he did send me to culinary school), but mainly it is because I feel I am doing a disservice to a restauranteur who is doing an excellent job in a tough business by not sharing their efforts with the community. Tonight we dined at Argana, a new Moraccan restaurant on Sahara and Durango, which my husband expects will close within a year. This is due only to its hidden location, however, and style of cuisine. I can't remember ever hearing anyone say "Let's go out for Moroccan" prior to this evening, and I eat with adventurous people, so his point is valid. I hope, however, this isn't the case. If you’ve ever eaten at Marrakech (which I believe is the only other Moroccan restaurant in town and a landmark on Paradise), then you will have an idea about what Moroccan food is - sort of Greek with a spiced up flare, heavy on mint and preserved lemon. Though Marrakech has the added benefits of belly dancing every night and eating on the floor with only your hands, Argana’s food feels more authentic and special. It is certainly less tourist trap-y and less expensive as well. We got out for less than $70 (including tip) for a filling meal with dessert and little extras. We started with the Calamari Steak appetizer, served with preserved lemon, spicy tomatoes, and chick pea relish. I’m kind of over calamari because preparations tend to bore me and quality is all over the place, but this was recommended by the waiter and I tend to be a sucker for servers. Surprisingly, this dish proved to be a revelation in calamari. True to the description it was as thick as a small steak, and was uber tender with the texture of a firm and meaty scallop. The lemony relish was balanced and addictive, with a definite kick to waken the taste buds. It was the best dish of the night, but not by far. We continued with the Fresh Fava Bean Salad with garlic, chermoula sauce, and spicy radishes. Chermoula is a mixture made with herbs, oil, lemon juice, pickled lemons, garlic, cumin, and salt - a lovely combination. This dish was equally delightful, and our only regret was not asking for pita bread with which to sop up the remainder of the sauce. Our entree was the Chicken Tagine, which unfortunately did not come in the customary ceramic dish with a conical lid, but did come with the aforementioned pita bread for the delicious sauce. The chicken was tender and juicy, having the consistency of perfectly cooked breast meat but with the richer flavor of the dark parts of the bird. I was accompanied by velvety potatoes, olives, and thick slices of their house made preserved lemon. Dessert was a Mint Tea Almond Panna Cotta that jiggled appropriately and came with a delicious lemon sauce on top (I'm pretty sure there's lemon in every dish here). The mint on top was a bit overpowering, but that was truly the only criticism of the meal. Another highlight of the meal included the hot Moroccan tea, a slightly sweet and minty concoction served in a pretty cup that stayed full throughout the meal. I would be remiss if I left out some information regarding the atmosphere. One thing that we always look for in a new restaurant is if it would be a place we can take my parents. I wouldn’t go so far as to call my mom a prima donna, however, decor, service and a full bar are things she sure appreciates. Considering Argana had all three down pat, I’m excited to bring her here. Do yourself and the restauranteur a tremendous favor by checking out Argana. I would love for my husband to be wrong about his one year prediction - I don't think that will give me enough time to check out the entire menu (twice). I've been wanting to write about Saffron Flavors of India for awhile, despite the unfortunate name, but had been holding off since lunch buffets don't photograph very well. My horribly lit dinner pictures aren't anything to brag about either, but don't hold that against the food as this just might be our new favorite Indian restaurant in town. Saffron Flavors of India, not to be confused with plain old Saffron on East DI, is the first Indian Chinese fusion restaurant I've seen. Though traditional dishes found on the menus of most Indian restaurants make up the bulk of the menu, some interesting plates catch your attention immediately. One dish that sounded particularly enticing to us was the Paneer Chili ($7), an appetizer of homemade, mild Indian cheese dressed in a sweet and sour sauce with green peppers and onions. I know it sounds strange, but it was actually quite successful. The sauce wasn't sickeningly sweet and artificial tasting as sweet and sour often can be, and we loved tasting Chinese flavors in a dish that actually had some heat. Non-fusion dishes were just as successful. The sauce of the lamb rogan josh ($15) was a deep brick red and flavor-PACKED, letting you know someone loved it for awhile. My mushroom and sweet corn masala ($13) was served in a sauce that was equally complex and flavorful, yet I was disappointed to see that canned mushrooms were used. The sauce was so incredible, however, I really didn't mind at all. Anyone who can make canned mushrooms taste so good gets a big culinary thumbs up from me. I also enjoyed the addition of corn, which replaced the more common peas found in many Indian mushroom dishes. Fun little extras included a superb raita with crunchy chunks of cucumber and crispy onion pakora. If you love onion rings, the latter is a must try. We also loved the bullet naan ($5), a flatbread stuffed with cheese, potatoes, chickpeas, onion, cilantro, and green chilies. It made me think this restaurant could do well as the first Indian pizza joint. Sadly, I fear this restaurant may not survive due to it's location. It's actually fairly easy to get to as it is right off the 95 at Craig, but the new strip center it's in is dead with no signs of budding life. Max Jacobson, if you're reading, please add this to the list of Frugal Foodie spots you've subsequently reviewed in Seven Magazine. You reach a lot more people than I do and I hate seeing these mom and pop's dissolve - R.I.P Taqueria Los Parados and Vegas Cafe. I hope I can entice my own readers to go by mentioning that restaurant.com is currently offering certificates valid for dinner only. Today they have 60% off for St. Patty's Day with the code LUCKY, but if you sign up for their updates they offer discounts just as deep nearly every week. You can also same money by taking advantage of their great lunch buffet. The number of items is limited, but it's a bargain at just $8.99. Note: Saffron Flavors of India has a full bar, great service, and pleasant atmosphere, though the decor could use a little modernization. Greetings to my followers who haven't forgotten my blog despite my haitus of nearly one month! I apologize for the much overdue post, but I've been busy with the upcoming opening of our new dog boutique, and more importantly, I just haven't been inspired by any restaurants lately (that is, until now). I've dined at La Palapa twice this week because it is a perfect Frugal Foodie spot. This Mexican seafood restaurant offers incredibly fresh underwater fare at incredibly affordable prices. Yay! I insist that you start with a Modelo Especial served michelada style, or 'preparado' ($4). 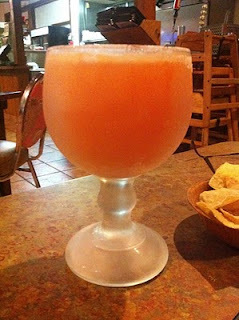 This is a light Mexican beer laced with hot sauce and fresh lime juice, served ice cold in a massive salt rimmed goblet. Sounds strange, I know, but once you try it you'll be hooked. Ian and I actually had a similar drink served to us in a plastic cup at the HUGE Broadacres swap meet on the north end LVB, which I also recommend for delicious cheap eats, but this is the first time (and certainly not the last) I've had it in a restaurant. 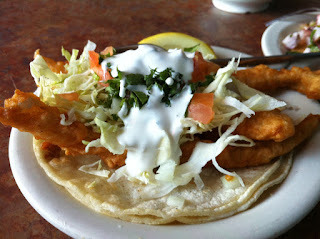 Then, you should order the fish taco ($3). This was primarily desirable to me because of the price, but once it came to the table I knew I wouldn't be let down. It needed a shot of acidity (may I recommend their house salsa, a dash of Tapatio, and a squeeze of lemon?) but the beer battered fish was hot, crispy, and oh so good. 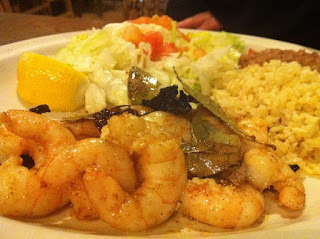 The entree of shrimp served "a la palapa" (I love saying their name, try it!) came to the table looking one note and blonde, and not in the appealing sort of way men like. I was amazed, however, after taking the first bite of snappy, sweet shrimp. It was flavored with bay leaves and some sort of dried pepper, and tasted fantastic, especially when bundled up in a warm tortilla with their great refried beans and rice. 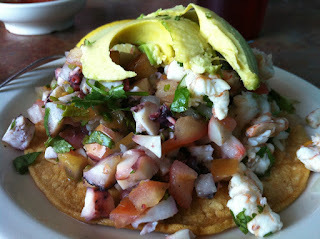 I also very much enjoyed the combination tostada of octopus (pulpo) and shrimp (camaron) ($3.75). There aren't many places outside of the Mediterranean you can get great octopus (my screen saver is a picture of the cephalopod dish we had on our cruise last year), but this was fantastic considering our desert surroundings. It was tender, yet firm, and very fresh. In fact, none of the seafood I've had here has been anything but fresh, so if you like offerings of the sea but don't want to drown in debt, La Palapa should be on your 'must visit' restaurant list (I'm not the only one who has one of those, right?). PS. Do you like flan? Then don't pass on dessert. La Palapa's version is as creamy as cheesecake. I'm generally a poster child for self-restraint when it comes to over-indulging in foods that are very bad for you (I'm part foodie, part health nut), but I can only attribute that to my strict evaluation of whether or not something is worth the calories. The flan here most certainly is, so I left only a token bite. Check out my dog boutique! Dogs should eat well, too. That's why we created our own line of fresh dog food.